A slip knot is the first step in almost all crochet projects. There are multiple ways to create slip knots and this helpful guide shows one popular approach. It's a great choice for beginners who need to learn how to start their work. Not only does this slip knot method form the knot you need to begin, but it also starts the rhythm and motion that carries on through the rest of your crochet. As soon as you make the knot, you can continue on making chain stitches. If you are working on a crochet pattern, use the yarn and crochet hook outlined by the pattern instructions. If you are just working on learning crochet, start with a mid-size hook and yarn. A size G or H crochet hook and a worsted weight acrylic, cotton, or wool yarn would be a terrific choice. Choose a yarn that is a light color and not too fuzzy. Basic yarns are easier to work with when you are first learning to crochet and need to see the stitches. Note: These instructions are intended for right-handed crocheters. If you're left-handed, please see how to crochet left-handed for helpful ways to learn this craft. Grasp the yarn in your left hand, between your thumb and index finger, and allow the yarn to flow freely over your index finger. Support the yarn with your middle finger. The tail of yarn that's not connected to the ball of yarn should be in the front. Grasp your hook in your right hand, using either a pencil grip or a knife grip (the photo shows a knife grip). Your fingers should be relaxed enough to move freely, but they should grip tightly enough to maintain precise control over the hook. To start, keep the hook facing upward. Slip the crochet hook between your index finger and the yarn. Use the crochet hook to lift the yarn above your non-dominant hand. Next, twist the yarn to form a loose loop on the hook. Essentially you are turning the hook in a circle. This produces a twisted loop on the hook. It's not secure yet, but it is beginning to look like the start of a crochet project. Hold the end tail of yarn between your middle finger and thumb. Use your index finger to manipulate the other end of the yarn as it unwinds from the ball. The yarn should loop over your index finger and then pass between your other fingers to create good tension. Wrap the yarn over the crochet hook from behind and then over the top. This may all feel a little awkward at first, but the more you practice, the more natural it feels. Before you know it, you'll be doing it without thinking. 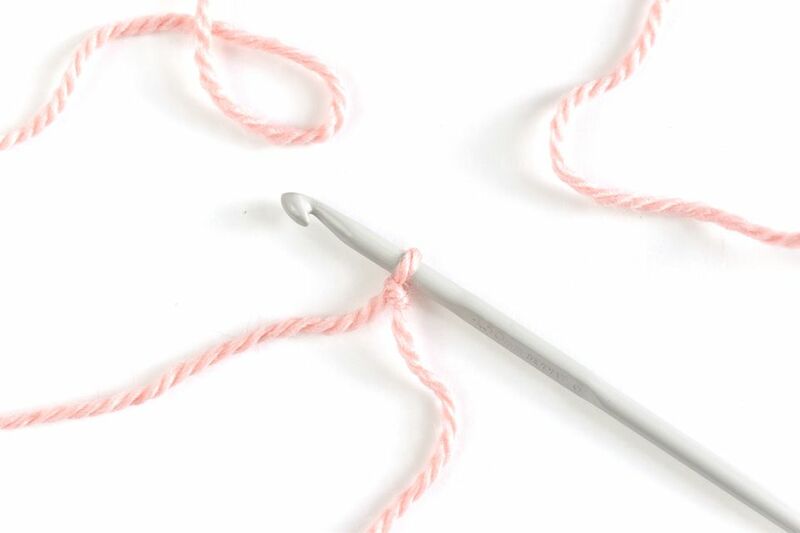 Use your crochet hook to draw the hooked yarn through the loop you created on the hook. The yarn that you are working with comes through the loop and forms a loose slip knot. You should now have a loose slip knot on your crochet hook. Leave the knot on the crochet hook and pull gently on both ends of yarn to tighten it. Be careful not to over-tighten it, as the crochet hook should move easily inside this loop. It should be snug but not excessively tight. Your first slip knot is finished and now you can begin your crochet project! The next step is to form your starting chain. Tip: In crochet, the beginning slip knot is not usually counted as a stitch. This differs from knitting, where the first slip knot does create a stitch. This can be helpful when you are first looking at crochet patterns, which typically tell you how many stitches to begin within your foundation chain.